Watching television or waiting in rush-hour traffic is unproductive, and contributes to the decline in social capital in communities across the United States, says sociologist William Schwab. Schwab’s book “Deciphering the City” addresses globalization, the psychology and structure of the city, and urban problems and solutions. Declining levels of social capital mean neighborhoods, schools and communities don’t work as well, and Schwab cites sprawl and television as major culprits. Increased television viewership has led to a decrease in community involvement. For every 10 minutes spent commuting to and from work, community participation declines 10 percent. Schwab reports that every form of civic engagement has declined in the past 25 years – fewer people vote, run for office, write letters to the editor, volunteer, attend church, read the local newspaper, watch the local newscast, visit neighbors or share family meals. The book is divided into four sections. The first section introduces globalization and its effect on the social, political and economic institutions in developed and less-developed societies. 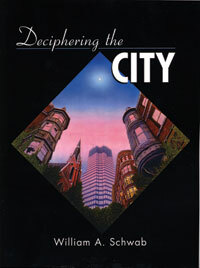 The second section deals with the psychology of the city and the community-building process. The third section looks at structure and patterns of the city, while the fourth section focuses on urban problems and possible solutions.